Victoria Beckham will sing with the Spice Girls again. The 43-year-old fashion designer had previously had no interest in returning to the stage with Geri Horner, Mel B, Mel C and Emma Bunton, but after a meeting with her former bandmates on Friday (02.02.18), she has now agreed to join them for a lucrative world tour, which will reportedly make the quintet £50 million. 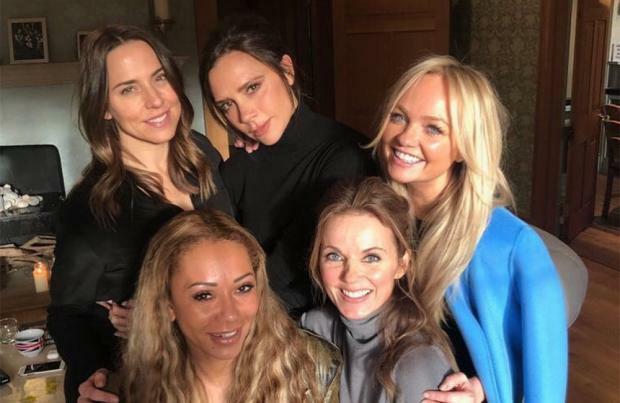 A source told the Mail on Sunday newspaper: "Victoria was so cold on singing and performing with the Spice Girls again but Friday's meeting made her remember the good times. "The girls sat together laughing and remembering the fun and special times and she is now very much in." The 'Stop' hitmakers reportedly have another meeting planned in Los Angeles around Easter time, where they will thrash out the details for their comeback shows. Though the group haven't yet confirmed the details of their reunion plans - which are rumoured to include an album and a possible TV show - Mel C has revealed they are keen to inspire a new generation of young girls. She told BBC Radio 2 host Dermot O'Leary: "There are so many negative things going on in the world all the time and we feel like the Spice Girls was always a little bit of fun -- something to enjoy when it's tough times. "We now realise some of the impact that we did have on young people at the time, and now we all have kids, there's another generation that enjoy our music. We just want to empower people, we want to empower girls. "We were talking about opportunities, ideas we have for the future. It's just great to be back in Spiceworld and to see the reaction and it's so lovely to know that people out there still care. "I think we always shared the same vision so it's really nice to be back and thinking about the future. "We are really excited to see what the future holds." Revealing how she decided not to join a reunion in 2016 after her bandmate Victoria decided against it, Mel said: "I know there are people that want to see it. But there were various reasons ... but the one thing that I couldn't get away from was that, we did reunite as a five piece [for the Olympics] and it was so incredible, and for me we are like a jigsaw puzzle and if there's a piece missing it's not complete. We're not a band of interchangeable parts. For me, it didn't feel right."